Kali is easily one of the most misunderstood figures in ancient mythology. To simply look at her image without seeing her symbolically or with complexity, one might just see a violent image of an enraged black woman. Many people shy away or dismiss this figure due to staying on the surface and taking powerful symbols literally, however Kali is not an energy to dismiss. For those who know the basic qualities of Kali, we know that she epitomises the dark, mysterious, vast, infinite unknown. She works via death and destruction and is not for the faint of heart. However there is a side to her that often gets missed and that is her as the all loving Mother. When we think of the role of Mother we might immediately turn to qualities such as warmth, kindness and softness. And although these are indeed qualities of Mother, they are not the only ones nor should they be placed at a higher value. Another face of Mother is the face of Kali; fierce, relentless and direct. What all faces of Mother have in common though, is Love. For anyone who truly wants to grow and experience self transformation, preferring one expression of Love over the other may be a mistake. Sometimes the love, the lessons, the nourishment we want is not what we actually need. Sometimes we really do need a strong, tough, fierce love that might be painful and knock you off your feet as a way to transcend lifelong limitations we’ve placed on ourselves. Kali is not a Mother to dismiss because she doesn’t show up the way that is preferred. She is a Mother that will love, tirelessly and endlessly, to hold you as you transform. Sometimes that Love just might need to be a bit tough and scary. It is darkness vibrant, sonant. Sweeping all from the path. To reach the pitchy sky. Destroys a world for e'er. I will confess when my friend and I decided to name our studio The Kali Collective, we didn’t fully understand the depth of this goddess or exactly we would call on her for, other than the obvious which is self empowerment and transformation. I didn’t even understand the potency or power that would be brought forth by invoking the energy current of this archetype into my life. But my goodness did I ever find out hard and quick shortly after creating a community space in honor of Her. She wasted no time with me. Here is a brief description of her, but do not be fooled, a few lines of description only scratches the surface of her depth, complexity, and power. 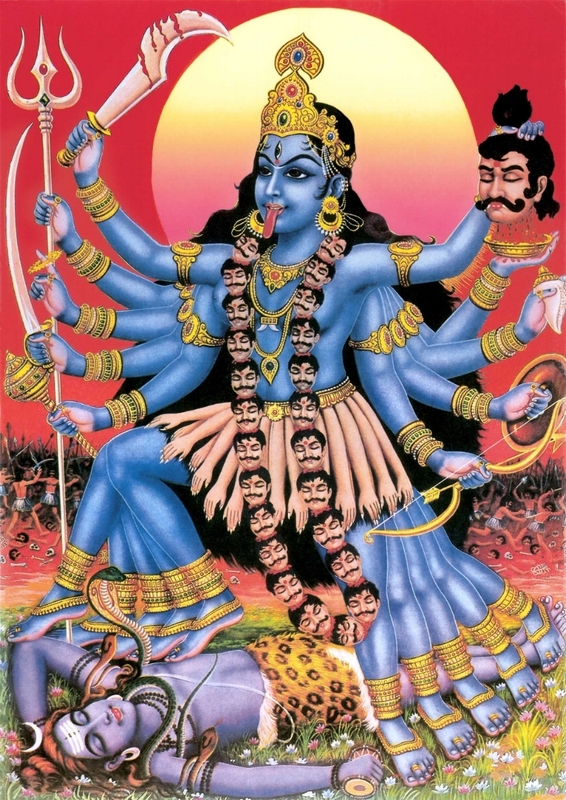 Kali is the Goddess of time, change, and destruction. She is the energy current inside of you that is wild, empowered and all loving. This energy is deeply involved in the life/death / life cycle to keep you growing and transforming, as does the rich practice of yoga. The Dark Mother in all her love and ferocity will guide you through transformation by dissolving all forms and time. She will tear things up to help you see what is needing to die inside of you, such as self limiting beliefs or attachments to the past that prevent you from moving forward. These deaths then create a fertile field for growth and creation of the new. She’s the darkness most of us fear. She is fierce. She is loving. She will transform you. Not bad! My life has been completely transformed but don’t think for a second it was easy. Who I was even 1 year ago is completely different to who I am now and the person I was for so many years was hard to let go of. My life as I knew it completely changed and the pain that came with it was intense. So make no mistake, it’s not as if I named my studio after her, meditated on her a few times and that’s it. It took much more work than that! Self reflection - ask yourself questions like, where are you suppressing your wild, feminine self? Or, is there somewhere in your life you are playing “nice” instead of expressing a more truthful, angry, enraged self? Offer your negative beliefs to Kali. Visualise bowing down to her and offering her your limiting beliefs for her to destroy. Journal with Kali - ask her the following questions: What do you have to teach me? How do you express yourself in my life? How are you suppressed? What do you think needs destroying in my life? Remember, Kali is not an energy to take lightly but she is loving. If you are ready to come alive, wake up and live your life fully, She is a necessary force to guide you there. Kali is the Goddess of time, change and destruction. She is the energy current inside of you that is wild, empowered and all loving. This energy is deeply involved in the life / death / life cycle to keep you growing and transforming, as does the rich practice of yoga. The Dark Mother in all her love and ferocity will guide you through transformation by dissolving all forms and time. She will tear things up to help you see what is needing die inside of you, such as self limiting beliefs or attachments to the past that prevent you from moving forward. These deaths then create a fertile field for growth and creation of the new. Meditation is a process to be more still in the mind. It can create a sense of stillness and calm, away from the stresses of life. There are no expectations with meditation, you do not need to sit completely still or have an absolutely still mind. Life is much more complex than that and meditation understands this. All we are trying to achieve in meditation is a slowing of the mind. A great way to begin meditating is with a guided meditation. Here are two videos by Kali's owner Steph to help you on your way! If you are interested in learning more about meditation, why not try a slower yoga practice such as Yin, Restorative or Nidra to introduce you into a quite space? These are the most amazing balls. I am no calorie counter and I am no vegan however I can assure you that these balls are so healthy and delightful you will end up making them weekly, like I do! They are quick, easy and filling. I do not like being told what to do, so I do not follow recipes. However I have attached the two recipes I kinda, sorta, very loosely follow to make sure I don't end up with bad balls. Something that is not on the recipe that I always add is Neat Nutrition Protein powder. Start by putting the almonds and coconut in a food processor and blend for a minute or two, until a flour starts to form. Then add the cashew butter, coconut oil and cacao blending for a few seconds before slowly adding in the dates. Continue to blend until everything has been combined together to form a sticky mixture. This mixture can then be rolled into balls and covered in more coconut and left in the fridge to firm up for an hour or alternately you can enjoy it with a spoon straight from a cup, or be like me and eat it straight from the blender! Either way you’ll love it! If you can resist not eating the whole mixture then keep the remaining bites in the fridge in a container. They also only take 3 minutes to make and require almost no washing up, which is always fantastic! Start by placing the almonds, walnuts and chia seeds in your food processor. Blend for 1 minute, until the a flour forms and the nuts have crumbled. Then add the remaining ingredients, pitting the dates before adding those. Blend for another minute until a stick dough forms. Use your hands to roll the mixture into little balls, place in a bowl and store in the fridge. The end of the year is a busy time for all of us, with all the commitments Christmas entails, and that can often takes us away from our regular yoga practice at a studio with a teacher. It can be frustrating to let go temporarily of that precious mind-body time in our week, but we believe a flexible approach to self-care is key to keep grounded throughout this period and beyond. Steph Wall, owner and principal teacher at the Kali Collective, has put together for you her 10 best tips to help strengthen your home practice and navigate the end of the year busy-ness peacefully. For years I struggled with maintaining a home practice. I made a million excuses, such as I didn’t have the space, I didn’t know what I was doing or I didn’t know how to do it right. But after discovering these techniques, I slowly created a strong home practice. Now I wake up early every morning to move in my own way. During this time, I find my balance, my grounding and my strength to set me up for a beautiful day. This is also where I create sequences to teach during class. This alone time where I can express myself fully. The creativity that arises from my home practice is staggering and exactly what I need to be able to share my practice with others. 10) Find a quiet place. Set yourself in a place where you know you won’t be interrupted. I prefer to set my mat at the end of my bed rather than in the living room because I know no one will bother me in my room. Finding a quite space is vital for me, otherwise I have the constant worry of being interrupted during my private practice. 9) No distractions. Phone off. Tell your roommates or family members you need this time for yourself and can’t be bothered. Make it clear to others and to yourself that this is alone time for you. 8) Music. Set a playlist that you know you can run for a while without wanting to change the song. For me, music has always been my escape. Whether it’s the Nine Inch Nails or Bon Iver, when I practice with my favourite tunes in the background, I know I’m allowed to wander into my own world. 7) Keep the lighting low. I really enjoy practicing in the near dark, either as the sun is rising or after it has set. Losing that sense of sight by not seeing myself in studio mirrors or even my own body in the light, allows me to just feel what’s going on in my body. What I look like doesn’t matter, as it never really should. 6) Take advantage of online resources. It’s amazing how many free classes are online. Just google or youtube free yoga practices. Being guided by someone at home opposed to a studio, allows you to create a space in your home that belongs to yoga. This is a great way to get you moving at home until you are able to turn off your computer and move in your own way. 5) Educate yourself on the basics. This allows you to stay safe. Once you start moving on your own, take the time to figure out the basics. When is it safe to do deeper back bends, twists etc? By trusting and listening to your body, you should have a good gauge of what’s right and wrong. 4) Ditch trying to make a sequence. It is not necessary to have a perfect sequence created in order to practice on your own. Yoga teachers have done hours of sequence training to develop creative, safe ways to move. For now, maybe consider covering the basics first before making longer sequences. Do one or two poses at a time until you become more comfortable and able to remember a longer order of poses. And if you try something and forget it by the time you get to the other side? Who cares! Do it when you remember. 3) Keep your practice short. It can seem intimidating to try to create an entire 60-90 minute class on your own. Try setting a goal of moving for just 10 minutes on your own. Once you become more comfortable being your own teacher, you will find that you need more and more time for your practice but let that come naturally. 2) Trust yourself. You don’t need to be a yoga instructor to be able to do your own home practice. As long as you know how to stay safe, anyone can practice yoga alone. If you are unsure about a pose, try it, close your eyes and go with how it feels in your body. Your body know’s what’s right or wrong. When you no longer have a teacher there to tell you the correct alignment, you then need to check in with the physical feeling of the pose in your body. If it doesn’t feel right, play around. 1) Stop thinking! Just move. Your practice doesn’t need to be or look perfect. Shut your brain off, forget about being your own teacher and instead do what feels great. Just because you do a warrior 2 every single studio class doesn’t mean you need to do that at home. In fact, take that time to explore other things. Breathe, listen, honour and move. Take time to develop your practice. Let yourself make “mistakes” and enjoy the expressions that arise within you. For those of you who are ready to advance their yoga practice after the festive period, Steph Wall is inviting you to Bali on March 10 - 17 2018, on a very special retreat entirely dedicated to fulfilling your potential. With only a small deposit required at this stage, why not treat yourself with a Christmas present with long lasting effects, well into the New Year? And we certainly laughed too! Remember all those reason we spoke about for wanting to learn arm balances and inversions!? Well, top of the list was to have fun and be challenged! And that's exactly what happened. You rocked it and it's been so fun to see some of you put those tools into practice since the workshop! I wanted to do a little write up about the workshop because I know it's easy to forget things. Remember that everything is a progression and we build bit by bit until we are upside down and flying around! I know that Chakra Tuning Workshop can be intense! You all did so amazing. It takes courage and bravery to step into the unknown - to a place that can drag up old stories and experiences - all to dive deeper into the self. And you all did it with elegance (most the time) and grace (some of the time!). Be proud.